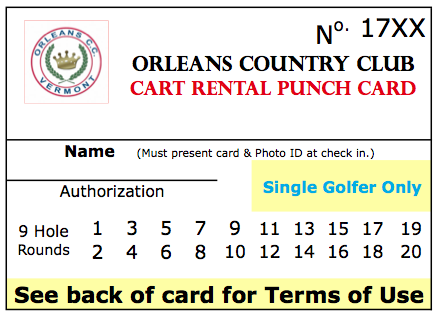 The Cart Rental Punch Card is offered at a special rate of $160 plus 6% VT Sales Tax! Price including tax is $169.60. Card can be used for NINE or EIGHTEEN holes and is valid for card holder only. The card is set up with 20 nine-hole rounds. Receive one punch when 9 is played and two for 18. Additional riders are responsible for their cart fee, unless the card holder chooses an additional punch(s) for their rider. Valid 7 days a week based on course availability for the 2019 season. Thank you, we appreciate your business at Orleans Country Club!